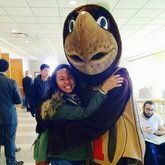 Prince Frederick is the creme de la creme of UMD dorms. 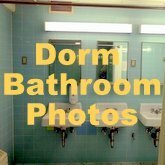 Not only is it the newest dorm on campus, but it also has great amenities. This is the 3rd floor girl's bathroom in Prince Frederick. The bathroom is laid out in a rectangular fashion. 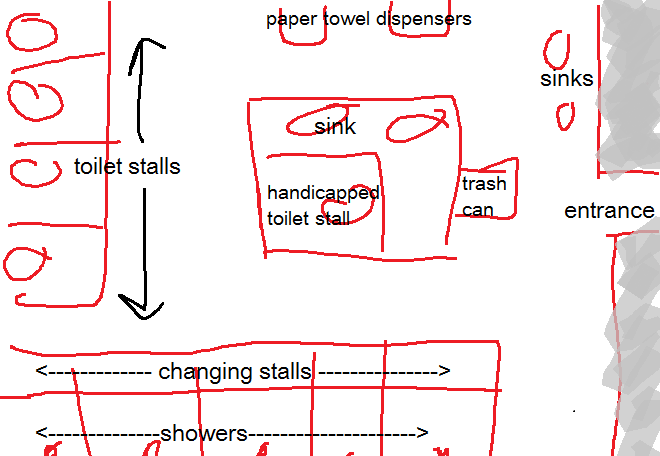 The sinks/trash can/handicapped toilet stall in the center act as an island of sorts. 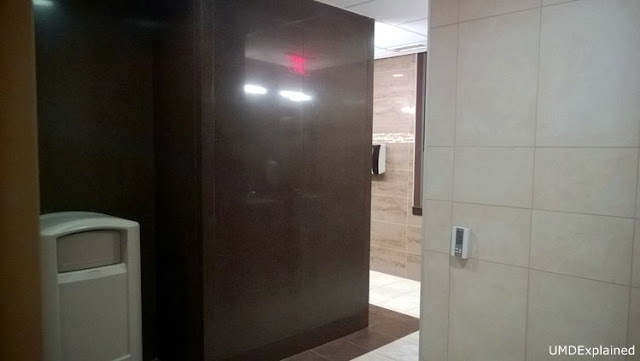 If you turn to the left, there are shower stalls. 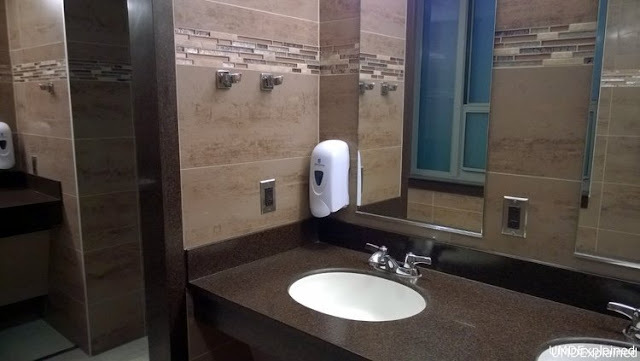 If you turn to the right, there are sinks. 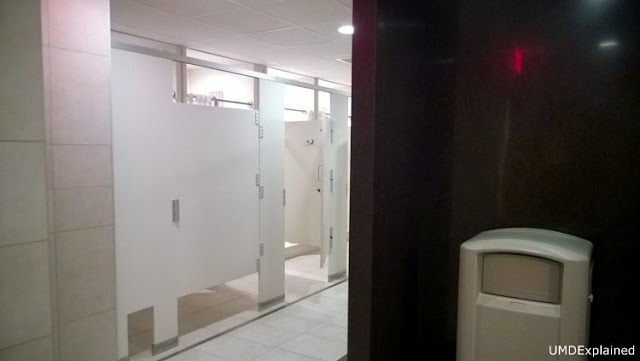 Toilet stalls are in the back. Here's a close up of the sinks. There are hangers for towels. 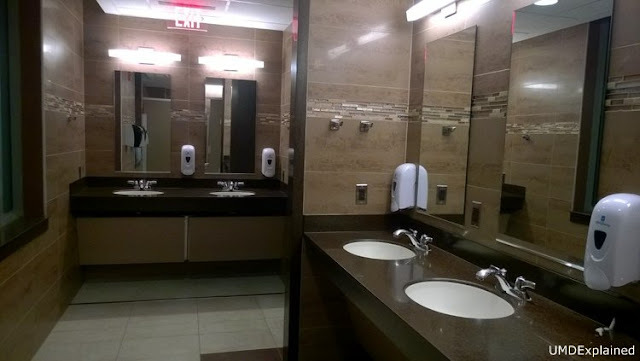 If you walk past the sinks, there are toilet stalls. 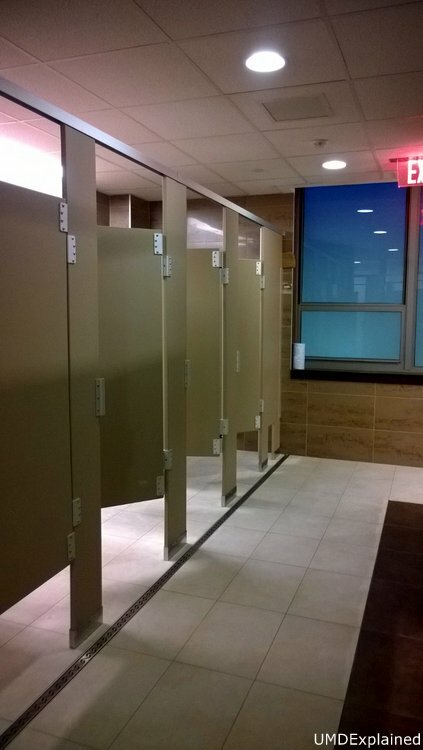 Here are the shower/changing stalls. 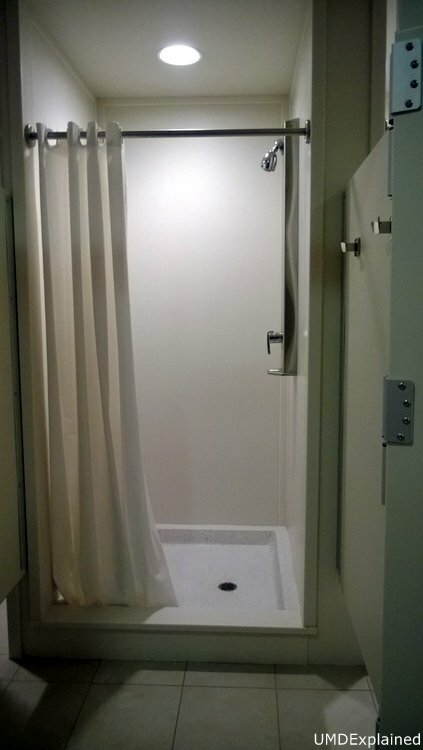 Each shower is directly connected to its own changing stall. 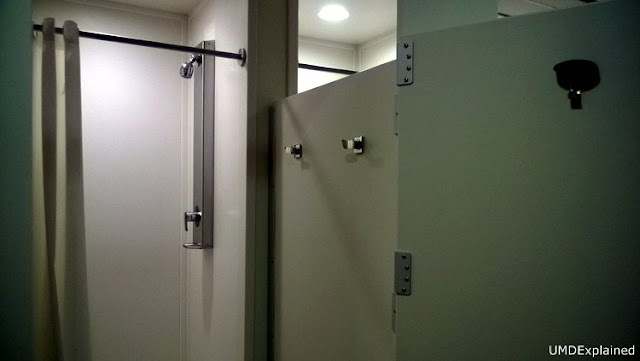 There are three hooks in each changing stall - two on the partition and one on the door. There are more hooks per shower in Prince Frederick bathrooms compared to other dorm bathrooms. Showers here are wider too. 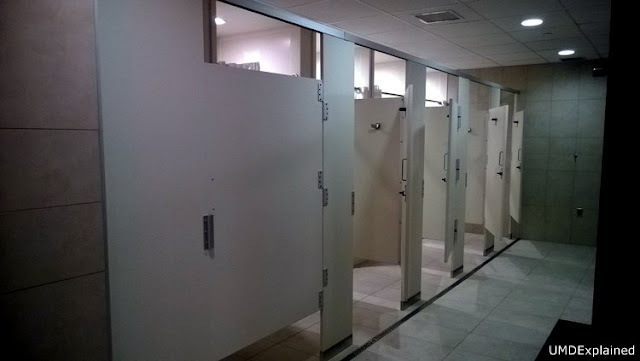 Here are the toilet stalls. There are 4 normal sized ones. 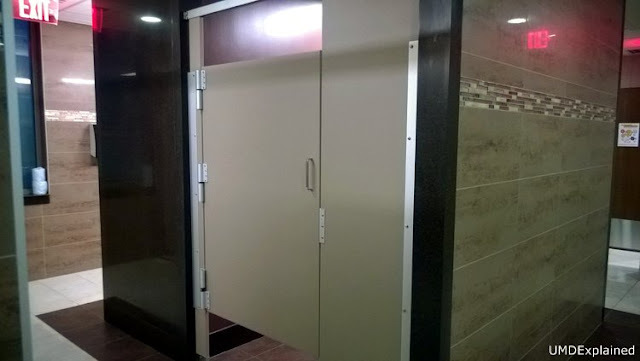 Opposite of the four stalls is the handicapped toilet stall. Look at the tiling! Prince Frederick is definitely one of the most fancy dorms on campus. 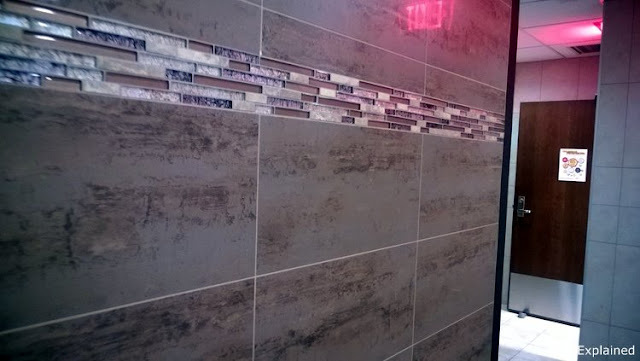 The fine print: Before you get too excited about decorative tiles and the fact that there are even counter tops, you probably won't be lucky enough to live here (unless you're in DCC or ACES. 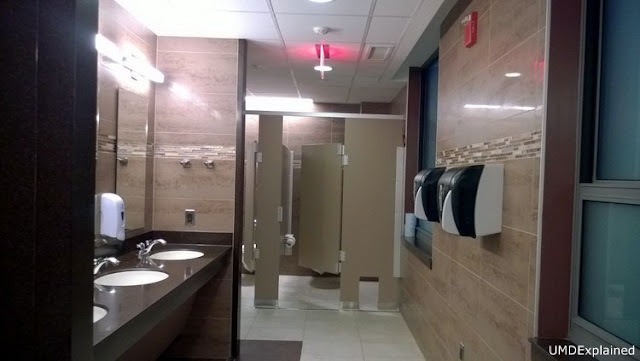 A more typical freshmen bathroom will look like this.